Split and the surrounding islands and towns on the Dalmatian Coast make a fantastic sailing area, with perfect distances between islands, beautiful scenery and great sailing conditions throughout the summer. Charter a yacht from one of the many marinas in Split or from the nearby town of Trogir for a week long sailing adventure to Croatian islands including Vis, Hvar and Brač. Contact us for your tailor-made yacht charter quote, we'll include a Skipper if you need one plus a bespoke sailing itinerary for your group. Fly into Split Airport then board your yacht in Trogir (only a 20 minute drive from Split Airport) & stock up with provisions for your week. Trogir is a lovely and historic town with UNESCO World Heritage status. The old town is actually a tiny island accessible by bridges, and is full of shops, restaurants & lively bars, so it’s a great place to spend a night! Alternatively if you manage to check-in in good time you might be able to leave the marina just before sunset – head to Maslinica on Šolta Island, which is a beautiful village only just over an hour’s sail from Trogir. Vis is one of our favourite places to visit – a little quieter than nearby Hvar or Split, it offers the chance to explore hidden beaches, caves and even an abandoned submarine base. Explore the blue caves to the west of Vis Island, then head towards the Pakleni islands for the night. There are so many bays and inlets on these largely uninhabited islands that they make the perfect place to drop anchor and cook dinner onboard under the stars. Well known for it’s beautiful architecture as well as it’s vibrant nightlife – this stunning island town rarely disappoints. Climb to the old fortress above the town for spectacular views, then sip cocktails at one of the many waterfront bars before enjoying one of the finest meals in Croatia. If you’re still going after all that – dance the night away at Kiva bar or Carpe Diem Beach Club. There’s lots to do for everyone of all ages in this busy, vibrant town. Situated on the north coast of the island of Hvar, Stari Grad is a quieter, more laid-back town than Hvar town. There are lots of winding streets to explore, with shops selling local produce and traditional gifts and great restaurants around every corner. Alternatively you could visit Stari Grad in the middle of the day, then head to Lučice Bay on Brač island where there are mooring buoys in this beautiful bay and a choice of two restaurants on-shore. 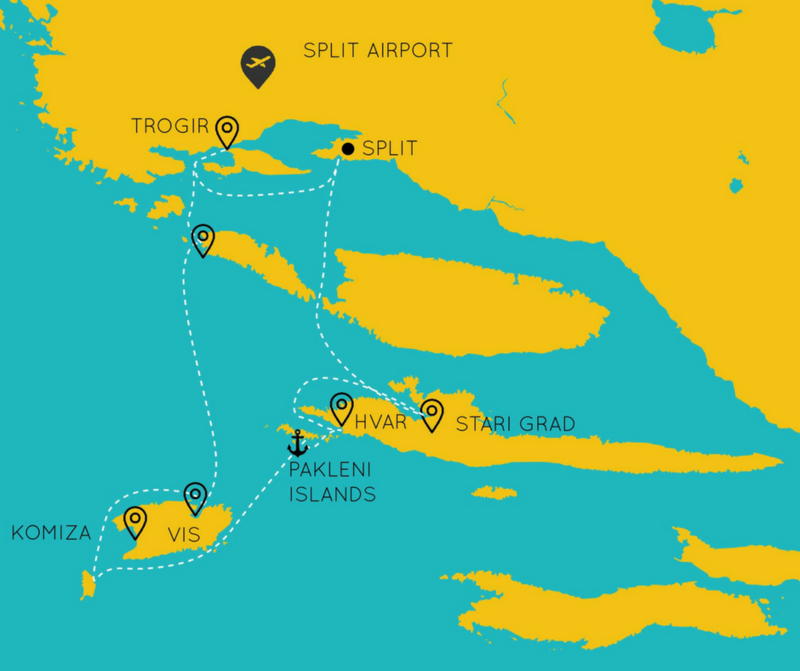 The biggest and most vibrant destination on this route, Split is a busy tourist destination in it’s own right. The old town is steeped in history, with winding narrow streets and traditional restaurants hidden round each corner. Sail to blue lagoon or another natural bay and enjoy your last day swimming and sunbathing. Head back to the marina around 5pm then head into Trogir for dinner – it is worth booking somewhere in advance as Friday can be busy! Check-out is at 9am Saturday morning – depart Croatia or begin your next adventure.